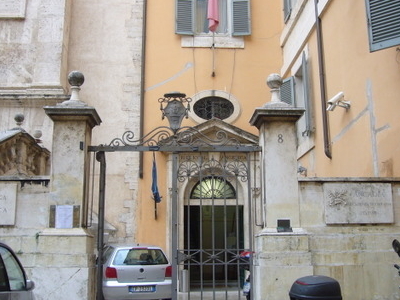 The Angelica Library (Italian: Biblioteca Angelica) is in Rome, Italy. It is a public library located in the Piazza Sant'Agostino square, next to the church of Sant'Agostino, not far from Piazza Navona. The library holds about 180,000 volumes of manuscripts (among them Codex Angelicus) and 1,100 incunabula, which formerly belonged to the Augustinians. These works are important for our knowledge of the history of the Reformation and Counter-Reformation. The library was established in 1604 by Angelo Rocca (1546-1620), and belonged to the Augustinian monastery. It was the second library in Italy (after Biblioteca Ambrosiana) opened for a public service (in 1609). Since 1940, the library has housed the archives of the Academy of Arcadia. Since 1975, the library has been under the supervision of the Ministry of Culture. Here's the our members favorite photos of "Libraries in Rome". Upload your photo of Biblioteca Angelica!